Despite the old saying encouraging you to hop back on your bike after falling off, it turns out that may be bad advice, particularly if you hit your head on the fall. After having one concussion you are more likely to have another — some doctors estimate you increase your risk up to three times. There are two reasons why your risk increases: carelessness and brain chemistry. The first reason is the obvious: After you hit your head, you will be slower to react. So if you jump right back on your bike, you won’t have the same reflexes to stop on a dime or swerve at the last minute. Surprisingly, this is actually more common than you might think. 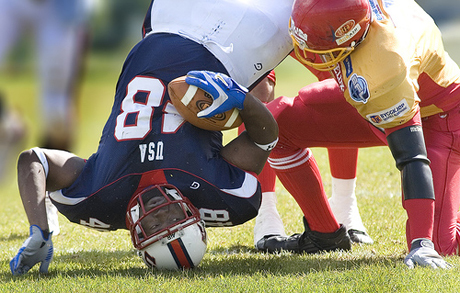 Devoted football or soccer athletes may return to a game sooner than they should after taking a hard hit, greatly increasing their risk of another concussion. Also, after you have a concussion, you’re less attentive overall, making tasks like crossing the street that much more dangerous. The increased susceptibility for a second concussion also comes down to brain chemistry. A concussion causes chemical changes in your brain, which leave the brain unbalanced and more prone to damage for up to a year, said David Hovda, director of the Brain Injury Research Center at the University of California, Los Angeles. What happens during a concussion, said Dr. Jamshid Ghajar, the president of the Brain Trauma Foundation, is that the pulling and stretching of your brain results in tiny tears in the white matter — the tissue connecting the different brain regions. The result is less attentiveness and memory and slower reflexes. Your brain is contained in fluid in your skull, much like an ice cube in a glass of water. Moving the glass back and forth causes the ice cube to slosh around in the glass. This is what is happening to your brain during a concussion. It’s not the movement itself that causes the concussion, but the force and acceleration of that movement, Hovda said. “It causes all the cells in the brain to fire — like the brain is having a mini-seizure,” he added. When the cells fire during a concussion, they release neurotransmitters. One neurotransmitter, glutamate, causes the cells to release potassium and take up sodium, the crucial chemical processes through which nerves send electrical signals. The brain is susceptible in this energy-deprived state because it does not have the energy to restore the sodium/potassium balance if it sustains another blow. Normally, blood flow to the brain would restore the glucose. But a concussion also causes the muscles around the blood vessels to constrict, reducing the amount of blood able to reach the brain. As a result, the brain remains in an energy crisis and susceptible to damage. In sum, suffering a concussion increases your chances for having another one because of the chemical changes that can leave your brain debilitated for up to a year. So the next time you fall off your bike, think twice before hopping back on right away. It in the jaw joint, once cartilage is dislodged in the TMJ, your more prone to “events”. The theory has been proven by the N.E. Patriots head and neck specialist. Two concussions in the past two years, the Colts have had over twenty in the same time span. Go to http://www.mahercor.com for more stories confirming this discovery to one of the solutions to protecting players. this is untrue. a concussion is more likely to occur a second time because the fibers supporting the brain become stretch following any kind of head injury, concussive or subconcussive, making the brain more vulnerable to even further injury, including what people call second impact syndrome, regardless of whether the individual sustained a concussion or whether they still have one. James,I feel the exact same after more than a dozen concussions during childhood,my brain feels highly sensitive to any g force,like say breaking in a care I feel my brain being pushed into the front of my skull or say lifting off on an airliner I feel my brain brining pushed downwards.its a daily hell to live with.